Hi everyone! This is Lilly from Lilly's Style. I'm so excited to be guest posting for the gorgeous Khatu (umm...girl crush) today while she is enjoying her vacation. Doesn't she have impeccable style?! I totally want to raid her closet. Today I thought I'd share with you just a couple of different ways I styled my favorite blazer of the moment. I only own couple of items in yellow, but it is such a cheerful color. Reminds me sunshine, and who doesn't like sunshine!?! Do you have a favorite piece of clothing at the moment? I love your whole ensemble. Where did you buy it?!?! Thanks :). I got it at H&M last year but I saw it again this past weekend. I really like the white and yellow look! Where are your pants from the ones on top? They are from the Gap. Fabulous outfit! 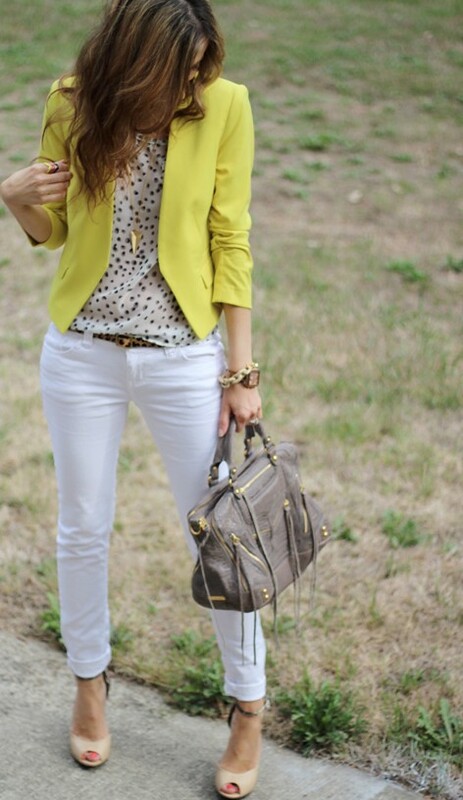 Your short yellow blazer goes so well with your flared jeans. I really love that style. Very cute and inspirational for a young professional! Where are your heels from ? They are from Sole Society. I love that jacket. Would you mind telling me what size you are wearing? H&M sizing can be somewhat tricky for me.